A fixed partial denture, also know more commonly as a bridge is one option of treatment when a patient is missing teeth, and has a tooth on either side of the missing tooth. When to build a bridge? Teeth can be lost due to dental decay, trauma or periodontal disease. When a permanent tooth is lost, this will affect the neighboring teeth, and cause a change in the chewing function, support and perhaps even esthetics. The surrounding teeth can begin to shift and move as well. This can cause further breakdown and deterioration of the mouth. 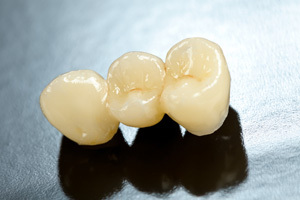 A bridge can be made similar to crown preparations. The two teeth neighboring the missing site are prepared and these are called “abutment teeth”. Then the laboratory fabricates the bridge as a multi-unit restoration – the two abutments and the false tooth (called a “pontic”) are joined together. This type of procedure can be used for more than one missing tooth. Beware however, the longer the span of missing teeth, the weaker the bridge becomes and the greater chance of failure. Bridges can be made of porcelain and/or metal. We will discuss with you the ideal materials for your mouth and what the best options for treatment are for your specific situation when you come in to see us.